I get food crushes all the time; I am a bit of a tart that way. However, I think this Vegan Mushroom Reuben Sandwich might be the real thing. 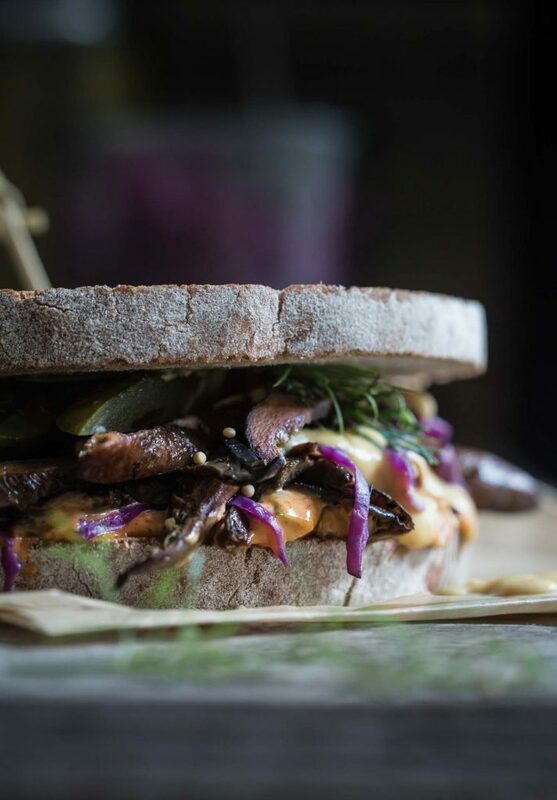 Pan fried spiced mushrooms, homemade red cabbage sauerkraut, Russian dressing and pickles combine in each wonderfully messy and textured bite. Eating a plant-based diet is a challenge for me. I didn’t turn the corner and all of a sudden start hating the taste of chicken and bacon or loathing goat’s cheese. I love animals and don’t want them on my plate but guiltily admit, they are a bit delicious. This path would be a lot easier if the smell of bacon didn’t still make me salivate just a little. I wonder if after all this time my reaction is a primal one or simply sense memory rushing to the fore after a mini lifetime of eating meat. 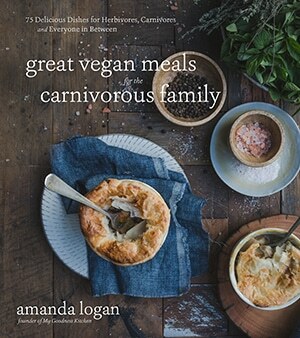 Given this, my dirty little secret, it is no wonder many of my recipes on this blog are veganised versions of foods I once enjoyed or simply variations on classics. My One Pot Tomato Olive and Lemon Spaghetti is a twist on Puttanesca without the anchovies while there are no prizes for guessing the root of my Sneaky BBQ Mushroom Steamed Buns. 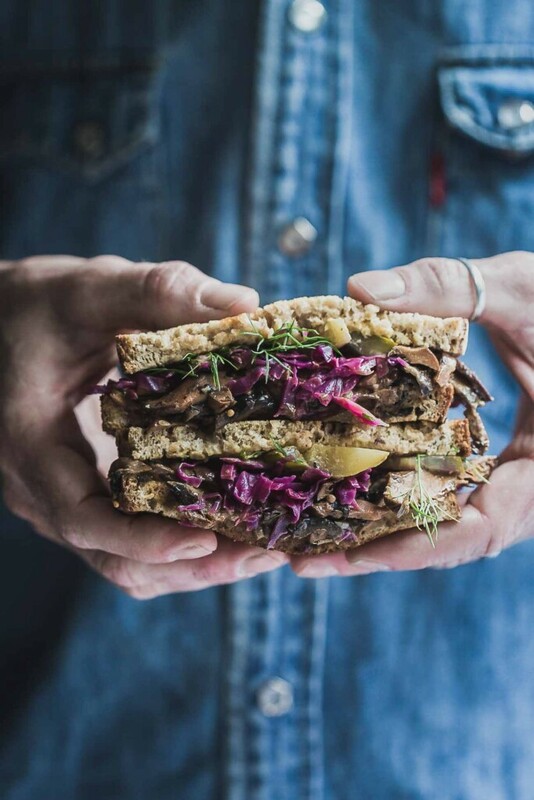 This Vegan Mushroom Reuben Sandwich is another twist on a classic. With a thirty-minute quick and dirty sauerkraut, meaty mushrooms and dill pickles finished in a spicy Russian dressing, this is a vegan version even the carnivores will love. While I would no sooner eat a pile of corned-beef these days than I would eat my dog, this Vegan Mushroom Reuben Sandwich is a “meaty” dish I can get behind. 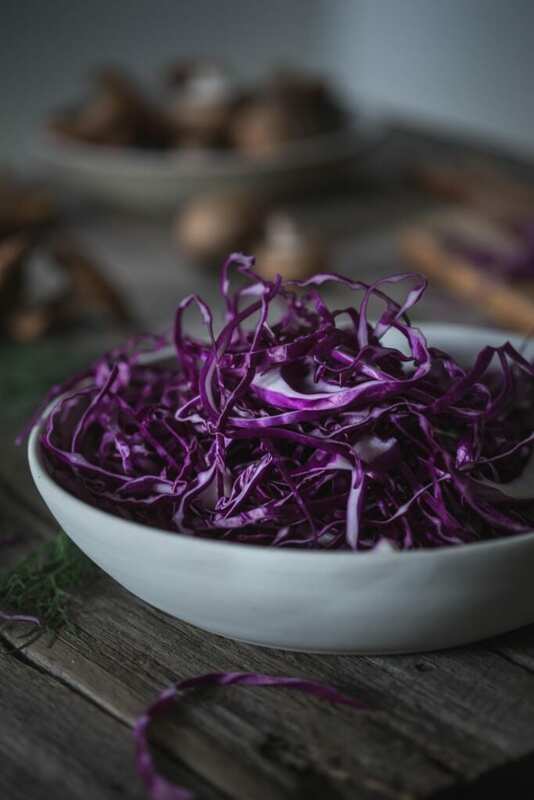 Earthy spiced mushrooms invoke just enough meat essence to fool my tastebuds while the vibrant red sauerkraut and spicy dressing add texture and balance. While my challenge continues each day, it becomes easier with a little invention and inspiration from the classics. *Elizabeth Weil offers a wonderful and funny account of the Reuben Sandwich’s contentious history and her family’s part in it, here; it is well worth a read. If you try this sandwich, please let me know! Leave a comment, rate it, and don’t forget to tag a photo #mygoodnesskitchen on Instagram. I’d love to see what you come up with. Cheers, friends. 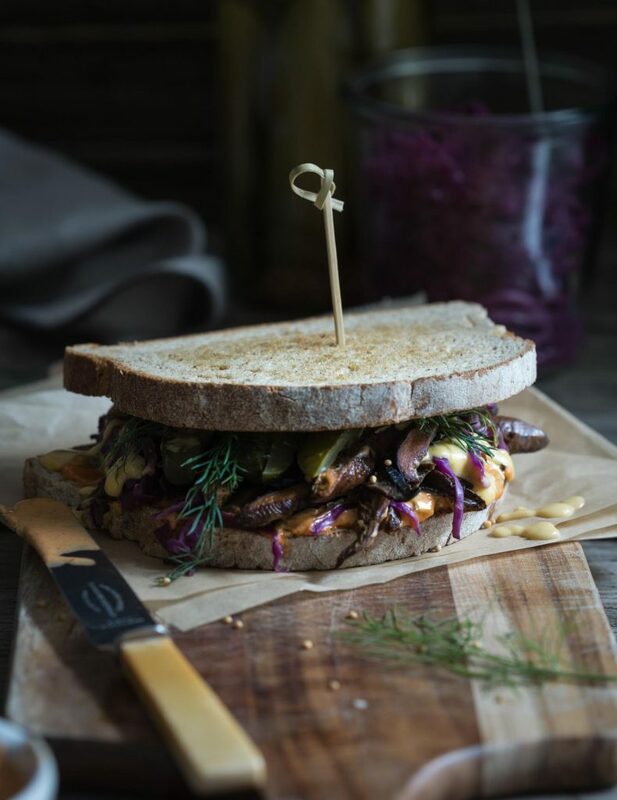 Sautéed spiced mushrooms, homemade red cabbage sauerkraut, Russian dressing and pickles pack a flavour punch in the Twisted Mushroom Reuben Sandwich. 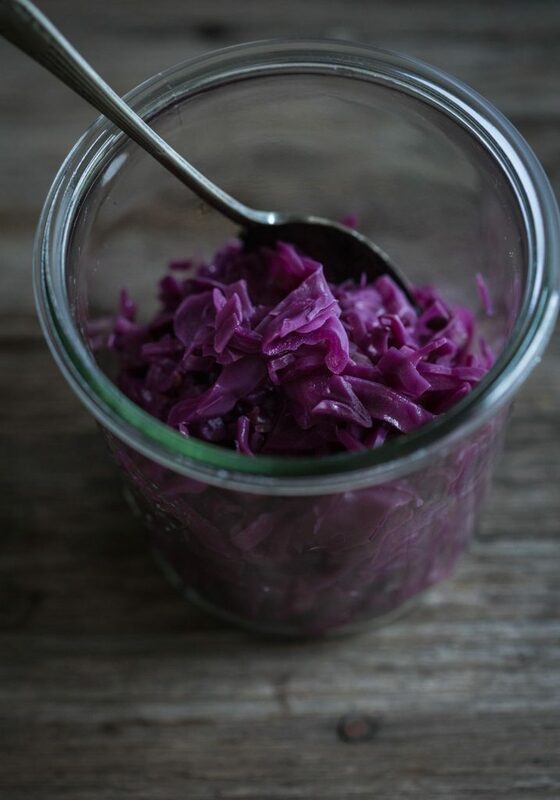 To make the sauerkraut, simply slice the cabbage in to thin ribbons after removing the core and place it in a large saucepan. Add the apple cider vinegar, water, sea salt and caraway or fennel seeds and cook down over medium heat, stirring regularly, for 35 - 40 minutes. Add more water if the cabbage begins to brown at the bottom. To make the Russian dressing combine all ingredients in a bowl and stir to combine. Finely slice the mushrooms. Heat a little oil in a large fry pan and sautée the garlic for 20 seconds before adding the mustard and fennel seeds. Add the mushrooms and toss through the spices. Cook for four minutes before seasoning with sea salt. To assemble the sandwich, lightly butter one side of the rye bread slices and place them butter side down on a pan. Grill until lightly toasted. Remove from the pan and smear the unbuttered side of one slice with a good dollop of the dressing before following with a generous handful of the mushrooms. If you are using cheese slices, add a slice now then add the sauerkraut and slices of the dill pickle. If you are using the cheese sauce, add a drizzle now. Place the second slice of bread on top (buttered side out) and return the sandwich to the pan and lightly grill until warmed through. My quick and dirty sauerkraut can be stored in the fridge for a week. What are pine and Swiss mushrooms? I have been an amateur mycologist for many years now and not sure what you are describing. Possible Latin names please? This sandwich looks absolutely delicious. I love reubens.. One of the only sandwiches ever to have my favorite thing – sauerkraut! Thanks for sharing! Thanks Billy. I love this sandwich too – so many delicious textures. Is that your site? Spoiled to Perfection? Very cool. I loved this sandwich, but are you using a vegan Worcester sauce? where can i find one? Hi Maisie, thanks for the message. I am so glad you like this sandwich – it is one of my favourites. I use a vegan Worcestershire sauce by Spring Gully. It’s vegan and gluten-free and I buy it at my local supermarket. You could try your local or go to a whole foods-style store and ask. Good luck! Kristina! Thanks so much for letting me know; I hope you do try it one day. Maybe an oyster mushroom might be more up your alley; not quite as mushroomy. Thank you for your lovely words. A.
Ooh this sandwich looks good. I don’t do flimsy, I like substantial and the sandwich certainly delivers. Whilst I eat meat, I also love veggies. Mushrooms give a real meaty bite to food and this is one sandwich I’d be more than happy to eat.